Outdoor Patio Ready for Fall! The entrance to a community is an immediate introduction to the culture and pride of neighborhood residents. It speaks to visitors, people passing through, and residents coming home. For many years, Historic South Atlanta’s entrance was a blighted convenience store. It was not welcoming, and it did not exemplify the heart of the community. In recent years, the area has been transformed into a budding commercial district with Community Grounds Cafe and Carver Market becoming neighborhood hubs of activity, connection, and commercial goods. Now, this location is home to another community project. 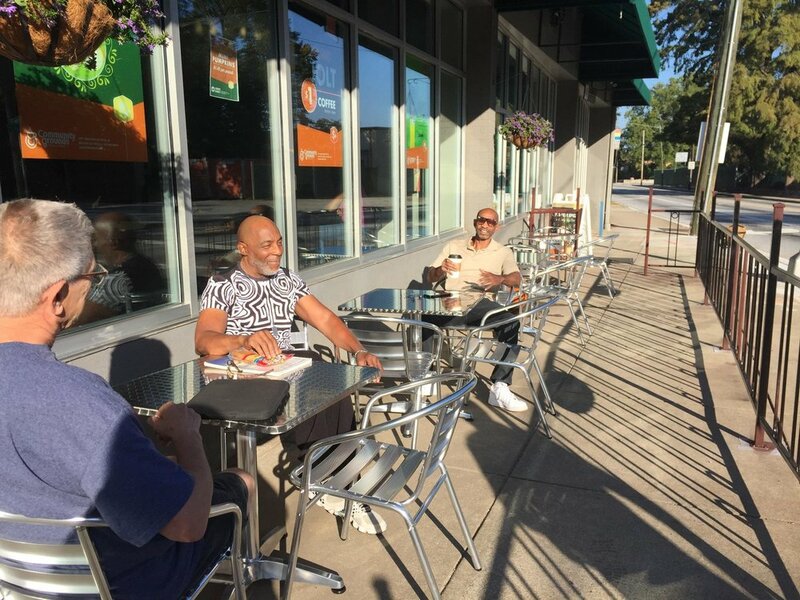 The South Atlanta Civic League partnered with FCS to create an outdoor seating area at the neighborhood’s entrance and in front of Community Grounds. The space is fenced and covered, includes planters for flowers and fresh herbs, and provides free 24-hour wi-fi access with no purchase required. Historic South Atlanta neighbors initiated this idea and secured funding. They also designed the built structure and installed it! It has truly been a group effort every step of the way. Thank you to the Community Foundation for Greater Atlanta, the Lakewood Amphitheater Finance Committee, and the City of Atlanta for helping our neighbors create a beautiful new community space! We love coming home to our neighborhood! And now, as others enter Historic South Atlanta, they too will see a thriving community right at the neighborhood entrance.